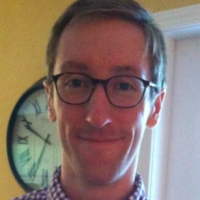 David Rambo received his PhD from the Graduate Program in Literature in May 2018. His research and teaching consider the intersection of materialist philosophy, media theory, and contemporary cultural forms including literature, cinema, and games. His dissertation, Technics Before Time: Experiencing Rationalism and the Techno-Aesthetics of Speculation, conceptualizes technicity, or the generic nature of technology. It reconsiders the human's relation to technics by examining a host of technocultural examples and by weaving together the philosophies of 20th-century French rationalism, Bernard Stiegler’s technological phenomenology, Eugen Fink's transcendental phenomenology, and Whitehead’s speculative cosmology. His writing has been published in Angelaki, Process Studies, and, with colleagues from the lab S-1: Speculative Sensation, Hyperrhiz. My dissertation attends to Bernard Stiegler's seminal contribution to a technological phenomenology, except that I substitute the rationalist materialisms of Marx, Whitehead, and several 20th-century French philosophers for Stiegler's Heideggerian canon. This intervention reconnects a philosophy of technics to broader philosophical questions concerning cosmology, the living-milieu relation, and transcendental structure, while also staging the empirical existence of technics in our present capitalist context. I have also written about and presented on contemporary finance, aesthetics, film, and video games.